Our performance consistency test explores the extent to which a drive can reliably sustain performance during a long-duration random write test. Specifications for consumer drives typically list peak performance numbers only attainable in ideal conditions. The performance in a worst-case scenario can be drastically different as over the course of a long test drives can run out of spare area, have to start performing garbage collection, and sometimes even reach power or thermal limits. In addition to an overall decline in performance, a long test can show patterns in how performance varies on shorter timescales. 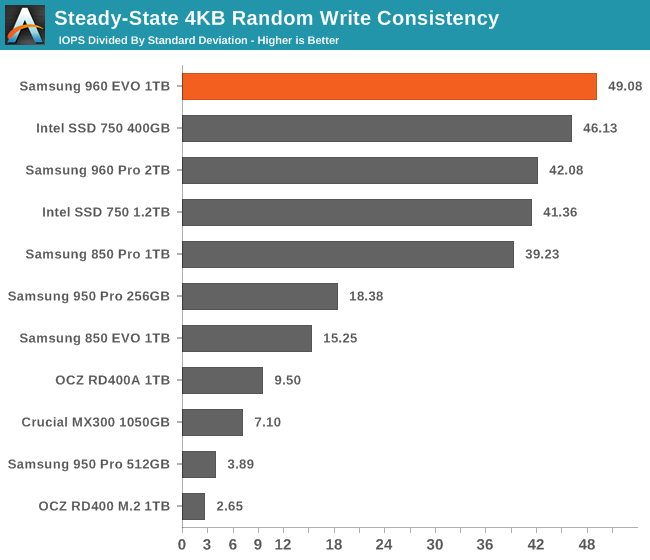 Some drives will exhibit very little variance in performance from second to second, while others will show massive drops in performance during each garbage collection cycle but otherwise maintain good performance, and others show constantly wide variance. If a drive periodically slows to hard drive levels of performance, it may feel slow to use even if its overall average performance is very high. To maximally stress the drive's controller and force it to perform garbage collection and wear leveling, this test conducts 4kB random writes with a queue depth of 32. The drive is filled before the start of the test, and the test duration is one hour. Any spare area will be exhausted early in the test and by the end of the hour even the largest drives with the most overprovisioning will have reached a steady state. 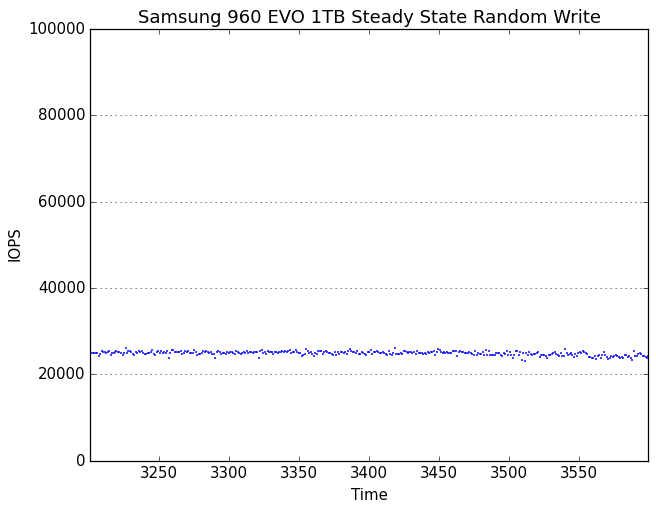 We use the last 400 seconds of the test to score the drive both on steady-state average writes per second and on its performance divided by the standard deviation. 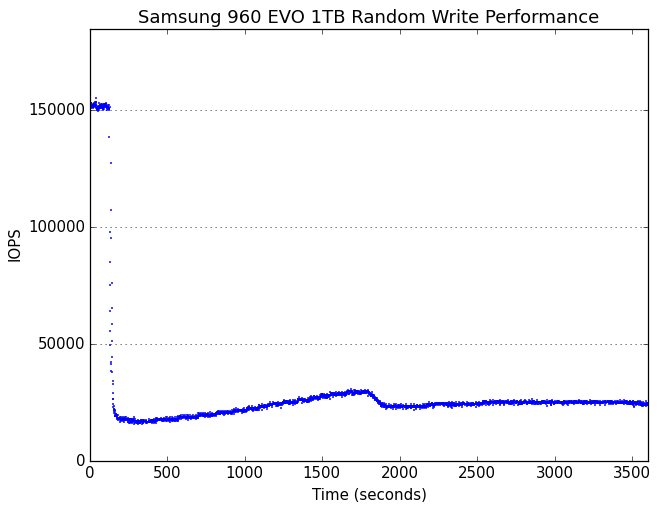 The 960 EVO's steady state random write speed is not quite as fast as the 960 Pro, but it's in the same league and much faster than most consumer SSDs. 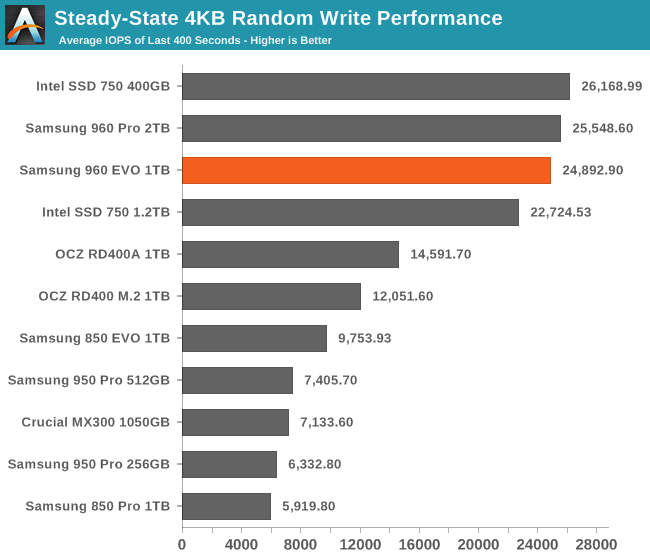 The 960 EVO sets a new record for combining high performance with consistency. It's a bit slower than the 960 Pro, but less variable. Highly consistent performance is a good thing, but it makes for a boring graph. The transitions from peak to sustained performance modes look the same for both the 960 Pro and the 960 EVO. The 960 EVO responds to extra overprovisioning with even more consistent (and high) performance. The 960 EVO is today, what the 850 EVO was a couple of years ago. Buying anything else makes little sense. The 850 EVO is still today an excellent SSD with a fantastic price/performance ratio.